A couple of months ago we were in San Francisco. I was curious to see an Amazon bookstore so we went to their San Jose store which is in Santana Row, a popular high-end shopping mall that also includes a Tesla dealership. This is Silicon Valley, after all. It’s no secret that when Jeff Bezos first looked around for an industry he could optimize as the entry point to his online retailing empire, the publishing industry offered the most potential for drastic efficiency improvements. But bookstores are businesses with paper-thin margins (no pun intended), so when I first read about it, I couldn’t understand why Amazon would want to operate anything so unprofitable when they already dominate the online bookselling business. In the months that followed the opening of Amazon bookstores, various pundits speculated on the real reason why Amazon was going into bricks and mortar retailing. More on that later. All the books are displayed with covers facing out, which is pretty nice for browsing, but which also reduces the number of books they can carry. One article I read says the store only carries around 3,500 titles. 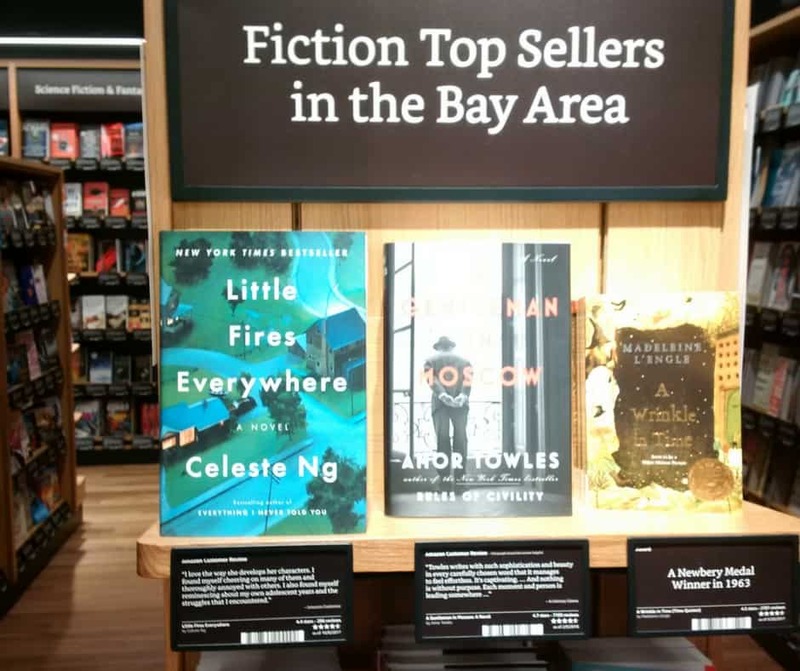 In addition to the shelves arranged by genre, like any bookstore, there are table and end cap displays organized according to Amazon rankings. 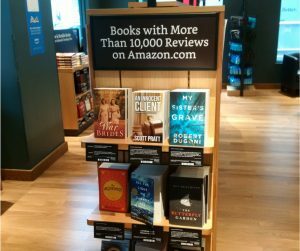 There are categories such as Books With More than 10,000 Reviews on Amazon.com. Highly Rated 4.8 stars and above. 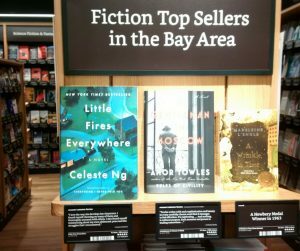 For a bit of regional flavor, there are Fiction Top Sellers in the Bay Area. All data-driven selections based on Amazon’s vast database of most popular books. By the way, a book may have 5 stars, but based on as few as 20 reviews. 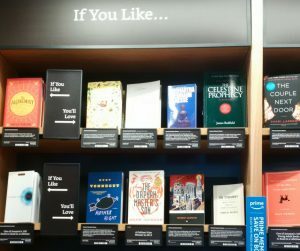 The most worthwhile takeaway: The bookcase of If You Like This, You’ll Love This suggestions. That’s something any bookstore can adopt. 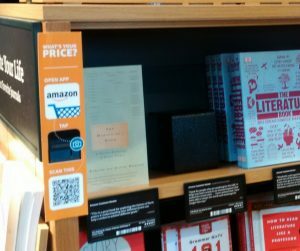 You can buy Amazon devices - Kindles, Fires, and Echos at the store. 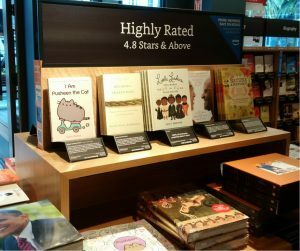 The printed shelf-talkers under each book include the book’s star ranking, number of reviews, a bar code, and a short review. 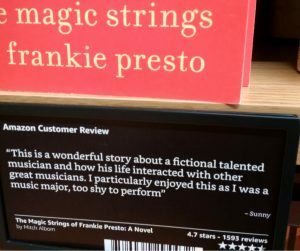 A review from Goodreads or Amazon, written by a reader. Some of which are truly bewildering. But it means there is a review under every single book, and the staff didn’t have to read them all. There are no prices – you can check the printed prices on the books themselves, but as we all know, Amazon discounts the list price. The physical and online stores have the same prices, so this is one store where having customers do a little showrooming is not a problem. (NOTE: ‘showrooming’ is a retail term for when customers check out the merchandise in a physical store but then go buy it online instead for less). If you’ve got your phone with the Amazon app, you can bring the book to a scanner or take a photo of the bar code on the shelf-talker and you’ll get the prices: the regular Amazon price and the Amazon Prime price. For a more comprehensive write-up of their integrated shopping experience, read this article from The Strategy Group. 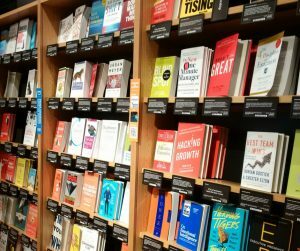 Jennifer Cast, the VP of Amazon Books, has been quoted as saying that each store has curators who apply “data with heart”. So I asked one of the staff how the books were selected. Yes, it’s all based on Amazon bestsellers and categories. What about Staff Picks, I asked. Is there a bookcase featuring books the staff recommend? She hesitated. There isn’t a single bookcase of staff faves, she said, they’re kind of on shelves throughout the store. As in, I prompted, they’re books already selected via Amazon rankings but you like them a lot too? 1) It’s another way to persuade people to sign up for Amazon Prime, growing that most valuable of corporate assets – a predictable, recurring revenue stream. 2) Amazon is using the stores to experiment with software that allows them to track both offline and online customer experience data. 4) Since Amazon is now a book publisher the stores will give their authors more physical presence and help attract big-name authors to their imprint. This Computerworld article offered these and some other theories; I’ve provided some links to other articles at the end of this blog. 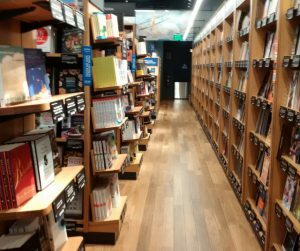 Well, what do I know about why Amazon is opening physical bookstores? If the people whose job it is to track the publishing industry can only speculate, what can I add to the discussion? There are definitely people for whom the Amazon bookstore works. 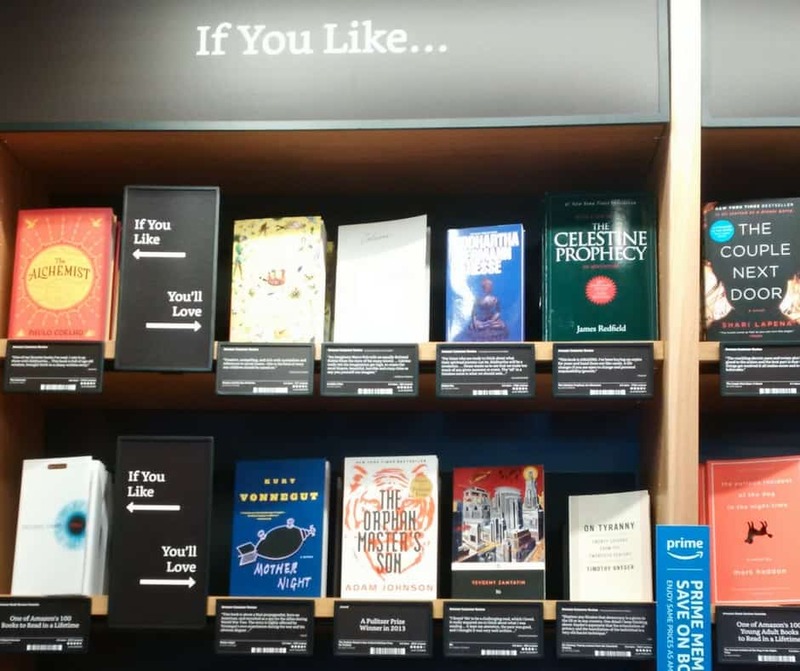 They’re fine with the virtual store made tangible, with extending the online experience in a bookstore with the aid of their smartphone, with placing their trust in a starred ranking generated by the likes and dislikes of thousand of readers. 3,500 books at one time is enough for them. It's a good bookstore business model for Amazon - a rigorously pruned selection of books that will sell easily, validated by market data, culminating in big inventory savings. But I worry that such an approach funnels our reading choices down to just the top-ranking books. Never mind what that means to us authors. I can't even go there. 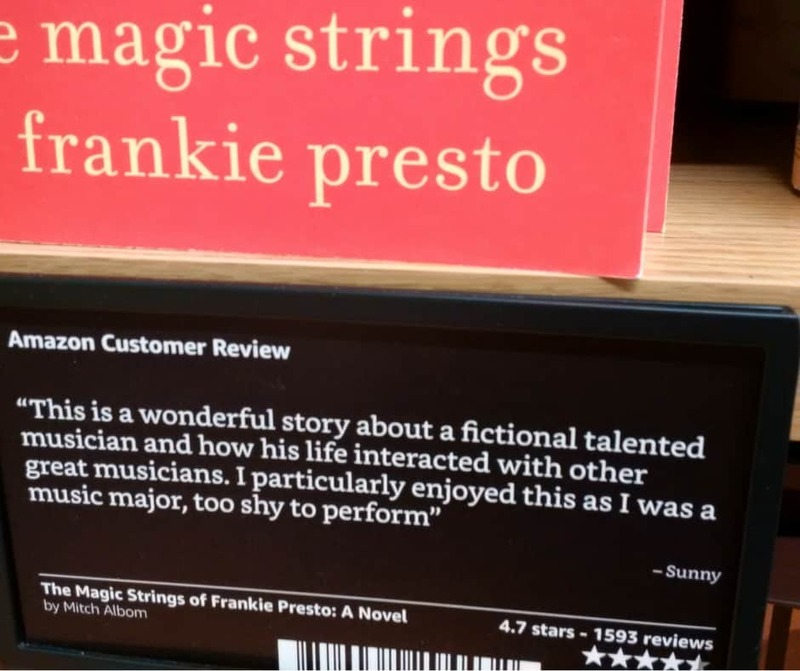 I am not the Amazon Bookstore's target customer. I can read online reviews more easily from home than on my phone in a bookstore; and anyway, scrolling through reader reviews is not my idea of a satisfying decision process. I want to talk to someone who reads books for a living, who can tell me why I'd love this book and discuss those reasons in person, with passion and intelligence. Someone who has taken the time to know me well enough to recognize I love both cats and Star Trek and thus my literary sensibilities will not be offended when he whips out Star Trek Cats. Which happens to be on sale. Here is what I do know as I write this blog on the evening of April 28. Today was Independent Bookstore Day in the US and Canada. I spent the day volunteering at two local bookstores. There were authors chatting to each other, talking about the books we love. I listened in on store staff helping customers decide on what books to buy. Which books had been a pleasant surprise, which book was getting rave reviews from everyone at the store. And of course I bought that book ( Circe , the latest from Madeline Miller). I glowed with the satisfaction of helping a real customer select a book for his daughter. I had helped someone discover a book. A bookseller doesn’t always get it right, of course. But whatever the outcome you are guaranteed a good discussion about the book both before and after reading it. For me, the pleasure of those conversations, which often lead to discussions of other books, is a big part of the joy of discovery. My local bookseller is better than an algorithm. Thanks for this blog,Janie. I have not had the opportunity to visit an Amazon book store yet but this tells me I’m probably not missing much. Like you, I rely on the staff to help me when j can’t make a decision between two of r potential good reads or at the very least in a place like Cahpters I often relate well to Heathers picks at least as a starting point. Call me old fashioned but I like the personal touch. The only time I buy online is when I know exactly what j want and I can’t get it locally. Also one of the best places to find great advice on what to read is at the local book sales. The volunteers are usually avid readers and have a wealth of knowledge on what’s worth reading. Do they hold EVENTS? I’d be curious to know if there would be an opportunity to meet a fave author at one of their stores. Did you notice the ratio of traditionally published books to their own publishing in terms of shelf space and titles? Hello Dale – according to one of the articles I read, the stores really do go with the most highly rated books, whether or not they’re published by Amazon or others. I think their criteria is to stock the books that will sell most easily. And no, I didn’t ask whether they host events or author readings. Or own a Bookstore Dog or Cat.